When the tourists come to Thailand they mostly remember the sea, sun and amazing places they visited. But many also begin to adapt to eating and actually cooking Thai food at home. Even soldiers who were inthe Iraq war and are on leave in Thailand ask their superiors for Thai food to be served and even brought dry Thai noodle with them back to Iraq. Many authentic Thai restaurants have sprung up all over the world. The usual story is that a Thai woman found a foreign man and then moved to the man’s country and there she decides to open a Thai restaurant. 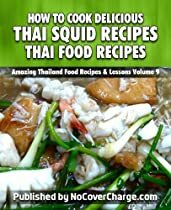 This series has 16 books and that is how many different variations we can draw out from Thai food and have not even included North, South and North Eastern Thai food. They are all different with their own specialities.